“So this is a stretch of highway where people like to run, ride bikes and take in this sort of amazing scenic view shed that we have on either side of the highway,” Shaw Hinze said. The council member stood next to large rocks which line the eastern side of the road. The boulders, or rip-rap, offer protection from big waves that are pushed ashore by high tides and storm surges. The boulders serve as a last defense against an ocean that is increasingly putting pressure on local shorelines. On some stormy days, it is best to drive on the freeway. “The highway was built on a very vulnerable sand spit. And this is what has been there to protect it for the last couple of decades. But as the conditions change and we start seeing more frequent high tides. What we’ve seen is that the highway becomes more vulnerable than it has been before,” Shaw Hinze said. And this is a roadway the coastal communities want to keep open. Photographs from 2010 show standing water on the highway and in the parking lots of several local businesses. “It has a history of going completely over 101 and closing the road and eroding it. 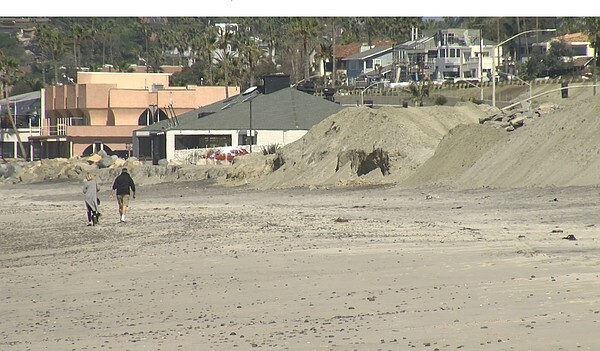 And we’ve had larger storms damage,” said Pete Milligan, city of Encinitas civil engineer. Highway 101 also flooded earlier this winter during a high tide that was coupled with a storm. At one point storm fueled waves pushed cobblestones on the surface of the blacktop. Milligan hopes to protect the road through a unique plan that also creates a sandy dune habitat, which is pretty rare along the California coast. A couple walks along the beach in Encinitas, Feb. 27, 2019. The just over $2 million Cardiff Living Shoreline Project is due to be complete in April. Read full article . . . .